In this lesson, you will learn how to begin tracking your social media activity right within Google Analytics. An Introduction to Social Interactions with Google Analytics. With the growing popularity of social media marketing, many companies have a desire to learn more about what social media properties are performing the best, and which social media interactions are getting the most results for the company. As we discussed in the Introduction to Google Analytics course, the new social media reports alone, are a very powerful tool in helping determine some of the answers to the above questions. By default, Google Analytics will automatically pull in social media traffic details from the biggest social media sources out there. For example, how many people clicked on one of your Facebook wall posts, how many Twitter users clicked on a company tweet and then made a purchase, and so on. These reports can all be found under Traffic Sources, then Social, and then you'll be able to choose your desired sub-report to dig into! Now, many companies are using social media tools as a key marketing tool in content dissemination. So, they've embedded social media interaction tools right on their websites, including, but not limited to: Facebook like buttons, Twitter share buttons, and Pinterest pin buttons. Take a look at the screenshot below from the popular social media news site, Mashable.com. Each of those social media interactive buttons have a code behind them to connect the action to the desired result of someone sharing that specific article on the user's social media page, or feed. By default, Google Analytics will not track these interactions. But, the good news is, with a little coding work, all of this data can flow seamlessly into your Google Analytics reporting structure. Google has developed a very comprehensive guide to setting up interactions on this link: https://developers.google.com/analytics/devguides/collection/gajs/gaTrackingSocial. The information in this sub-lesson will be a highlight of the steps needed to complete on your site. The first two parameters, network and socialAction are required fields, while opt_target and opt_pagePath are optional. So, we need to add these parameters right within our social interaction code on our site. And each action, such as a Facebook like button, or a Twitter tweet button, needs to have this customized code built in. Let's take a look at a Facebook like button example from Google's tutorial. You can see that it is customized to the Facebook requirements. In the second line, you'll notice they have included the parameters of facebook and like, so Google Analytics knows where to place this action. Overall, this process is fairly tedious, but the end result of having these actions listed within the Google Analytics reports can be very helpful. Let's get thinking about ways to use these tools on our own site in the concluding exercise next. Take a moment and read through the Google code page: https://developers.google.com/analytics/devguides/collection/gajs/gaTrackingSocial. Take a look at one example, such as a Facebook un-like, and develop the code specific to your website. Talk through your solution in class and share with the instructor. Now that we've gone through the setup requirements, let's take a look at some more specifics on these reports. To see the social engagement metrics, after the code has been successfully installed, this data will flow into the Social Plugins reports. This report can also be found under Traffic Sources and then Social reports. 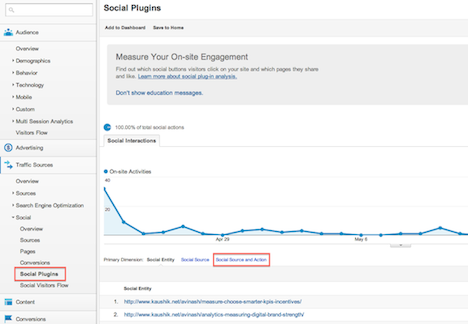 You can see an example of this report from the Google Analytics Blog. In this report, you will be able to see any of the social media interactions you setup earlier in this lesson and possible determine any actionable steps to increase your online marketing programs. How to Begin Using Social Interactions with Google Analytics. How to Set up Social Interactions. How to Track Social Media Interaction.